The sales team at CCTV Camera Pros is commonly asked “What is the best license plate recognition system?” or “What is the best license plate capture camera?”. As with any surveillance system, the best solution depends on the specific requirements of the project. For example, do you just need a camera that is capable of capturing plates clearly, or do you have more advanced requirements such as integration with a database or access control system. 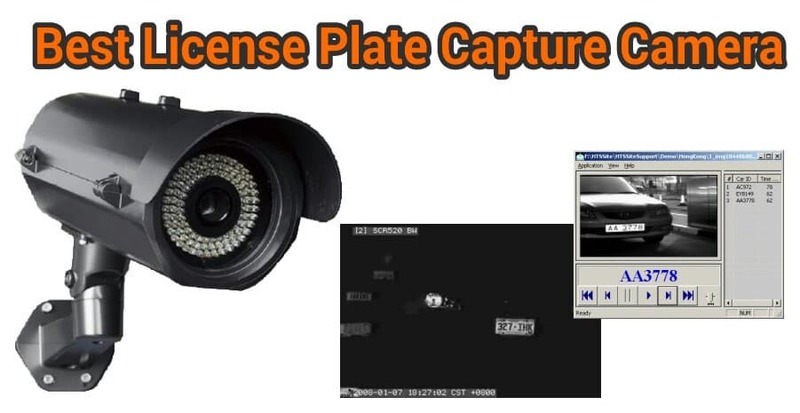 The goal of this article is to educate people on important information to consider when adding a license plate capture camera to an existing surveillance system or shopping for a complete LPR camera system. I will discuss hardware and software components that are needed for different situations. Important Update! This article was originally in December of 2012. This update is being provided on January 31, 2016 to let readers know about the latest high definition license plate cameras and DVRs that support them. Last year, several camera technologies were launched that allowed 1080p HD video to be captured by cameras and transmitted to a DVR using coax cable. Just like traditional analog CCTV cameras, these HD CCTV cameras are hard wired using RG59 Siamese coaxial cable. Hybrid DVRs have also been made available that allow analog CCTV and HD security cameras to be connected to the same DVR. These new HD LPR systems fit into the category 1 type of system described below, except that they capture video at 1080p resolution instead of the low resolution that analog CCTV cameras provide. Here are links to a few of the latest high definition license plate products available. The above video compares the LPR-TV75 HD LPR camera to an analog CCTV camera. Please be sure to adjust the YouTube player to 720p resolution when you view. The license plate capture systems that CCTV Camera Pros typically supplies fall into the two general categories as described below. In this case, the customer requires a surveillance system with a camera that is capable of capturing license plates clearly enough so that if an event occurs, the recorded video can be reviewed on the DVR and plates can be identified visually by an assigned person. Specialized high contrast LPR cameras are designed to capture license plates by compensating for the following variables: moving vehicles, the reflective material of license plates (such as plates used in the USA), headlights, and varying outdoor light conditions. 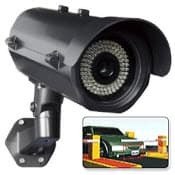 The solution we recommend consists of one high contrast black and white LPR cameras, a standard non-LPR surveillance camera to capture the color and basic overview of vehicles, and a surveillance DVR capable of recording 30 frames per second at 1080p resolution. The below diagram illustrates this setup. 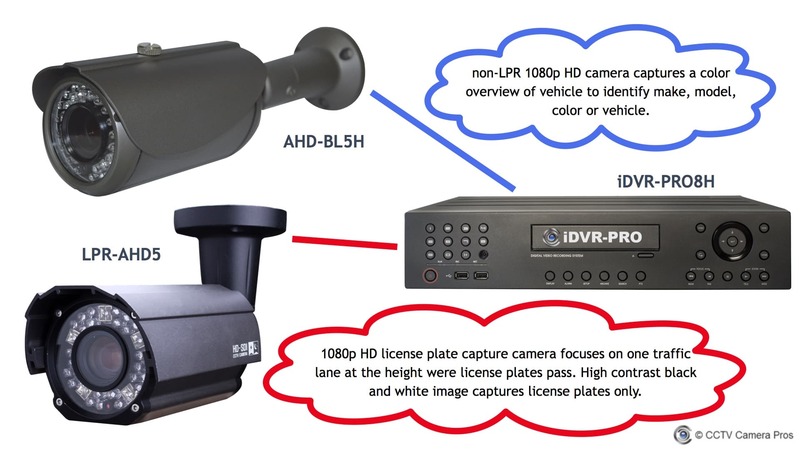 In this system, a LPR-AHD5 high def LPR camera is used to capture the license plates and the AHD-BL5H 1080p HD CCTV camera is used to capture a color overview of the vehicle. Both cameras are hard wired to a iDVR-PRO surveillance DVR which can be configured to record continuously, on a schedule, or on motion detection. We typically recommend iDVR-PRO DVRs for customers that prefer a stand alone / embedded DVR. This is our most recommended configuration. For customers that prefer a Windows PC based recorder or that may require access control integration in the future, we recommend our Geovision PC based DVRs . The LPR-AHD5 can be mounted up to 50 feet away from the area where the license plates are to be captured. The AHD-BL5H can be mounted up to 100 feet away depending on how wide of an overview you want to capture. Both cameras have a varifocal lens, which allows the installer to adjust the field of view (zoom) in and out during setup. For applications where the LPR camera needs to be mounted closer to the viewing area, the lens on the LPR-AHD5 can easily be adjusted. In this case, in addition to requiring a camera that is capable of recording license plates clearly, the customer also requires that the system be able to automatically identify license plate characters and take some type of action such as logging the plate number into a database or triggering a signal to an access control system automatically, such as opening a gate. The process of identifying the license plate is sometimes referred to as automatic number plate recognition (ANPR) or optical character recognition (OCR). Geovision offers an a license plate recognition / ANPR software add-on to Geovision PC based DVRs that enables the logging captured license plates to a database, triggering assigned access controls (entry gate), and even integrating with third party systems with the SDK. In this ANPR/LPR system, we use the same cameras as in the basic LPR, but we use a Geovision PC based DVR with the optional license plate recognition software. In addition to providing high-resolution video recording, the Geovision DVR (with the help of the optional License software) can also detects and recognize vehicle license plates via motion detection or via an input / output trigger. Furthermore, Geovision offers an software development kit (SDK), or sometimes referred to as an API, so that software developers can integrate the license plate capture with third party systems, such as logging the plates into an external database or integrating with a third party gate entrance system. 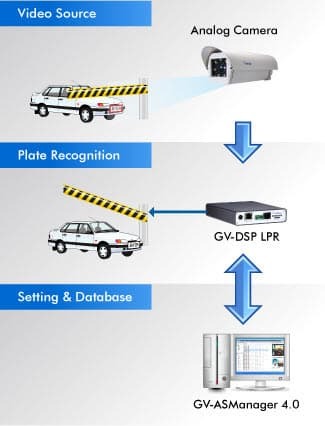 Another way to implement an LPR system that requires ANPR / OCR or access control integration is by using a Geovision GV-DSP LPR device, which is an embedded Linux based device that can work in conjunction with a LPR camera and Geovision DVRs or it can work as a stand alone unit with just an LPR camera. 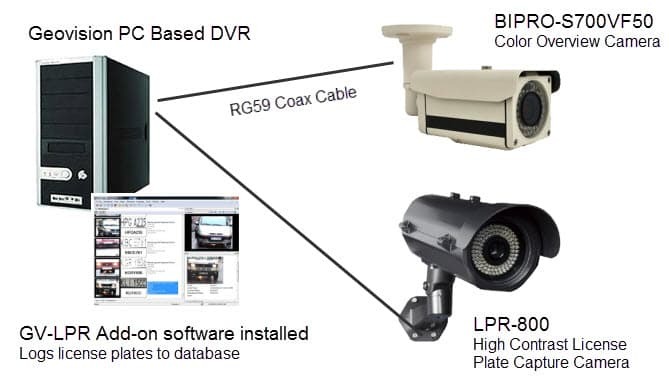 In the above example, an analog (CCTV) LPR camera is connected to a Geovision GV-DSP LPR device via RG59 coaxial cable. The GV-DSP LPR box is connected to a local network using CAT-5 Ethernet. A PC running the GV-ASmanager software (included with the GV-DSP box) can be used to manage the list of authorized license plates. Geovision NVR software can also run on the same PC that is running the GV-ASmanager software to record video from the LPR cameras and other security cameras that may be part of this system. It is very important to understand that LPR cameras are typically designed to focus on a single lane of traffic with the sole purpose of recording license plates. License plate cameras are not capable of providing both a wide-angle overview of an area with enough detail to capture license plates anywhere within that large area. This is why license plate cameras are typically used in conjunction with an overview camera that captures the overall vehicle, make, model, and color. As you can see in the below video, the high contrast LPR camera does a great job of capturing license plates but does not provide a good general overview of the vehicles and surrounding area. You can pause the video as a car approaches to get a clear view of the plates. You can watch more sample LPR videos here. LPR camera installations require more specific mounting angles than traditional surveillance cameras. 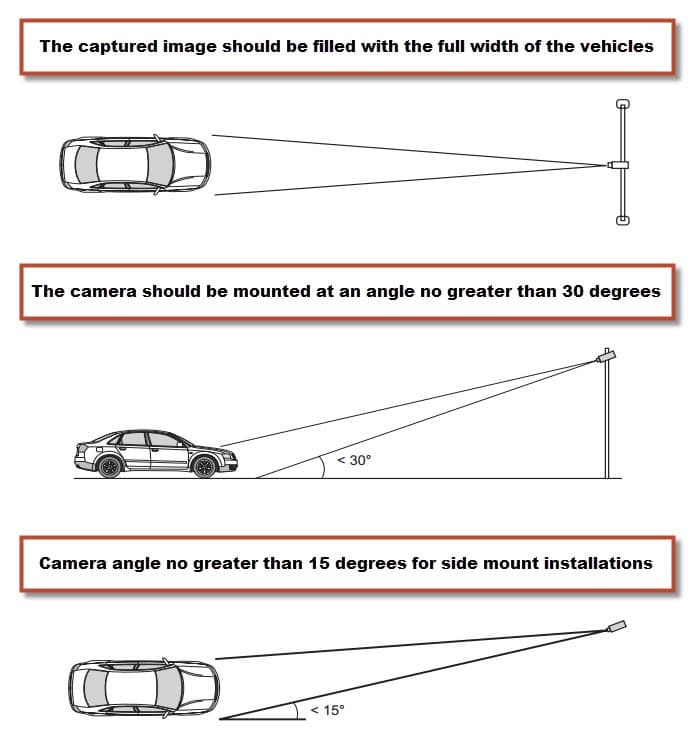 The angle at which an LPR camera is mounted must be specifically angled otherwise the plate will not be captured clearly. CCTV Camera Pros is a direct supplier of video surveillance systems for home, business, and government applications. We have been supplying license plate recognition cameras and systems since 2006 and we ship equipment worldwide. We are a US Veteran owned business located in Lantana, Florida (Palm Beach County). If you have questions about anything in this article or need help in planning a video surveillance system (with or without LPR capability), please contact the sales engineer team at CCTV Camera Pros. We can help plan simple systems for small businesses and residences, as well as large enterprise and government applications. We can be reached at via phone at 561-433-8488 or via email at info@cctvcamerapros.net. This article was written by the company co-founder, Mike Haldas.